Employee monitoring with time tracking, productivity measurement and screenshots. Berqun is a time management software for real time tracking of office activities and preventing wasted time. 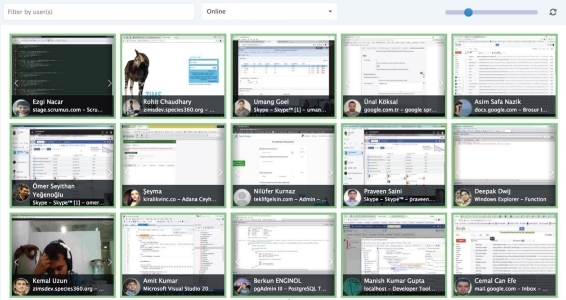 It is for tracking office and remote team’s time management and overall productivity. Do not spend your time on tracking, let Berqun do it for you! By using Berqun, you will have more time to plan grow your business. Assign the responsibility of tracking your team to Berqun. HR Performance Measurement and Analysis Made Easy! Berqun provides daily, monthly, yearly performance metrics for all your employees. It does the tough job by evaluating and scoring minutes and hours spent during office hours. Berqun monitors and converts employee activities into state-of-the-art performance metrics. 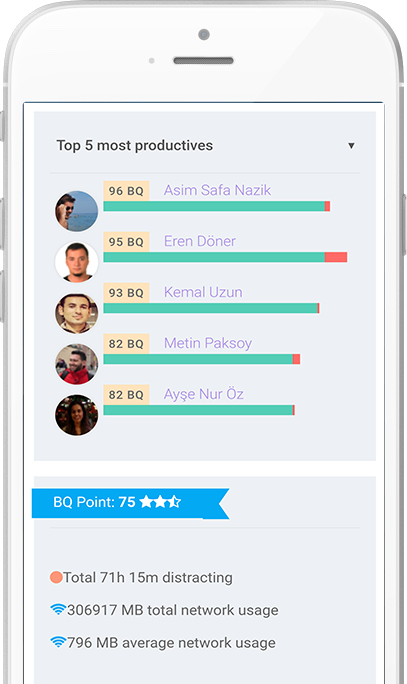 BQ scores are calculated based on ratios of time spent on websites and apps that YOU consider to be productive or distractive. Get a detailed look at when throughout each day your employees spend their time on productive vs distractive activities using their computers. See BQ scores for each day in a month. Analyze trends over time and drill down into any unusual changes. 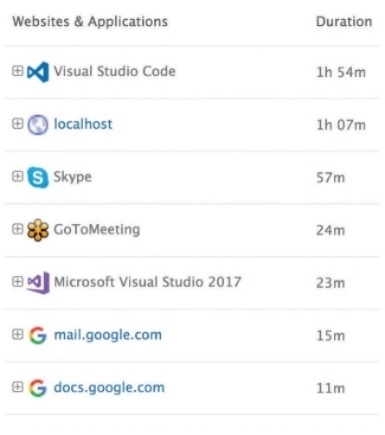 Optionally, record screenshots of employee computers at any time interval that you specify. Office TV feature offers a snapshot of employee screens in low resolution, protecting sensitive information. For any individual employee or for your team as a whole, see websites & applications used for whatever day, week, or month that you specify. Don’t rely on self-reported data. Instead get the real data of how time is spent in your organization. Understand how websites and applications correlate with employee outcomes. See what's worked in a detailed way. 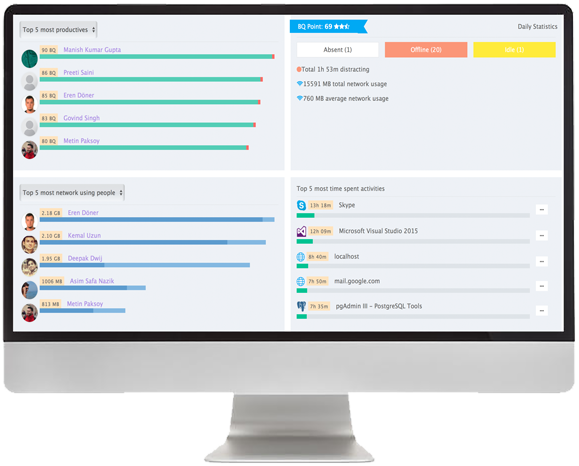 Analyze tracking information and get productivity scores. Watch your office computers to see what's being done. Find out network usage metrics and plan accordingly. Deployment in two options: cloud and on-premise. See the big picture of tracking information. Customize the settings and categorize the activities to fine-tune productivity scores. Receive performance reports in your inbox. Automatically hibernates terminals out of office hours. Stealth or transparent mode deployment.